Japan, 1983, 143 minutes, Colour. 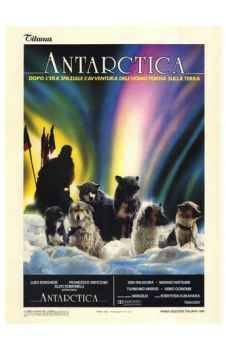 Antarctica is a Japanese film focusing on an expedition in the late '50s to the frozen continent and the plight of the dogs that they had to leave behind when evacuating their camp. The film is basically a dog film, focusing on the camp dogs, their ability with the sleds, their having to survive without human beings. The film is a portrait of nature coping with nature. The humans in the film play a subsidiary role. The focus is definitely on the dogs. However, the landscapes and snows capes are important - filmed in Northern Canada. The film also has an atmospheric score by Vangelis. The film might be compared with Antarctic stories such as Scott of the Antarctic as well as documentaries about Mawson and Shackleton. The film resembles the sections of Mr Forbush and the Penguins photographed by Arn Sucksdorff. 1. A film about Antarctica? Exploration? Human beings in the Antarctic Circle? The use of animals? Survival in Antarctica? 2. The importance of the location photography, the atmosphere of the Antarctic Circle? Landscapes, snowscapes, the sea? Blizzards and storms?, Snow and ice? The atmosphere of Antarctica? The special effects for the humans, their machines? The action photography for the activity of the dogs - especially their means of surviving? The use of Vangelis's score as background? 3. The information given about the Antarctic expedition? The background of the personnel, their lifestyle in Japan, the aims of the expedition? The scientific observations? The worthwhileness of such expeditions? 4. The decision for the humans to pull out? The sentiment behind the leaving? A hard decision? The leaving of the dogs? The regrets of the humans? The return to Japan? Returning to ordinary life? The film with its sequences of life going on in Japan? The concern of the humans for the dogs? Their return? The two survivors? 5. The portrait of the sled dogs - their physical presence, appearance, strength? Their work with the sleds? The relationship of the humans to the dogs? Caring for them, feeding them? 6. The decision for the dogs to be left behind, the tying up of the dogs, their reactions to the departure of the humans? The coming of the snow? Their freezing? The expectations of their death? their breaking free, the intelligence behind the manoeuvres to break free? The contrast with the dogs who stayed chained and died? 7. The film's focus on the dogs and their capacity for survival, racing over the snow, on the ice floes, catching fish? The deaths of the dogs and their pathos? The two survivors? The spirit of life and survival exhibited by the dogs? 8. The film as a story in the tradition of films about dogs, the best friend of humans, their inner capacities, their beauty, grace, their capacities for work, their skill in survival?